Mulwarra Export – Specialist exporter of premium Australian beef, lamb, veal, Wagyu beef, venison, seafood, game meat, charcuterie, poultry, goat meat, pork and specialty cheese. 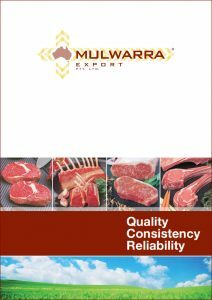 Mulwarra Export Pty Ltd is a specialist exporter of premium Australian beef, lamb, veal, Wagyu beef, venison, seafood, game meat, charcuterie, poultry, goat meat, pork and specialty cheese. Since 1997 Mulwarra has consistently supplied quality products into over 35 countries, enhancing our customers’ experiences by reliably delivering consistent products with an exceptionally high level of service. We have established long term relationships with key partners along the supply chain in select regions in Australia. This allows Mulwarra to source premium product with consistent quality throughout the year.